These are the nails I actually wore on Valentine's Day. This manicure was inspired by the second design on this post by Ashley of Polish and Konad - thanks for the inspiration! For these nails, I started off with three coats of Deborah Lippmann It's Raining Men, a bright cherry red creme. Application was lovely on this, could have gotten away with two coats except for a smidge of VNL. For the design I used Konad Special White with Bundle Monster BM11 and Konad Special Black with BM17. I think I used three coats of top coat on this (one after color, one after the first design and one after the second), using Deborah Lippmann Addicted to Speed. Let me tell you, I think this would have stayed on forever without any wear - after two days it was flawless and it was really tough to get off! 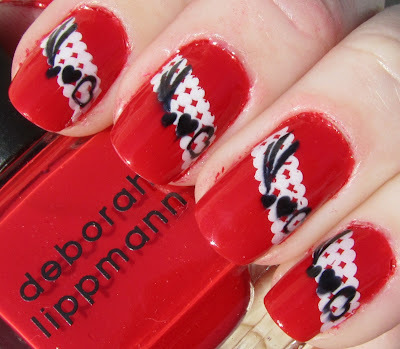 A great polish and a fun mani for Valentine's day! What a red polish! So cute! Very pretty! I love that red polish!! Soooo cute! And good to know that that topcoat is nice. I'm still in search of the best one! This is adorable, I love the name of the polish. I may have to go buy that topcoat. i love this so much.. so pretty..